Jalangi: On May 10 the PIL filed by MG editor Dr Zafarul-Islam Khan was heard by the Supreme Court which referred it to the West Bengal Human Rights Commission. The very next day West Bengal Govt. swung into action. A meeting was hurriedly held in the district magistrate’s office where the decision to disburse funds long blocked was taken. "Block Calamity Relief Committee" at Jalangi distributed monetary aid to 461 Padma erosion-affected families of the Jalangi block. This aid was given to the erosion-affected people after a gap of three years. Along with this, compensation to 762 families was also distributed for the damage caused to their dwellings by the torrential rains last year. All together 1223 families were given financial assistance on the 11, 12 and 13 of May by the administration. According to Sharifa Begum, member of the Block Relief Committee, the decision to distribute the said assistance was taken in the "Am Sabha" (general meeting), which was held on 5 May. The BDO of Jalangi block, Kanchan Chaudhury, informed me that the said Calamity Assessment Report was sent to the West Bengal Relief Committee in "Nov.-Dec." last year and the allotment was made in "Feb.-March". He expressed his inability to remember the exact dates. He further added that in the years 2002, 2003 and 2004 no allotment was made by the West Bengal Govt., although the block level committee had prepared the yearly calamity assessment report which, according to the BDO, is mandatory. When asked about the members who constitute the calamity assessment committee, he said that it comprised of one representative each of the Sabha Pati, the BDO and the concerned panchayat pradhan. Somen Nath, the block relief officer (BRO) informed me that the block level relief committee sends a report to the superior committees only when it is asked. They cannot send it on their own, he said. The Erosion affected families were given Rs 2000 each, and the rain-affected families were given Rs.2000 for fully damaged houses and Rs 1000 each for partly damaged houses. Another one-time relief to the erosion-affected was provided late in April in the form of 1000 food packets each containing: 5 kg. rice, 2 kg flour, 1 kg chura, 1 kg sugar, and some pulses, 200 ml mustard oil, 0.5 kg biscuits packet, one packet lectral powder as well as cash payment of Rs. 20 each family by a Hyderabad-based Muslim relief organization, Sahayta Trust. The relief work was supervised by Abghatullah, Abul Qasim and Dr. Minhaj from Hyderabad with the local help of Abdulaziz and Khodabakhsh of Jamaat-e-Islami Hind West Bengal branch. Our own organization, Charity Alliance, helped on the field since we have two full-time relief workers in the area. Charity Alliance, in cooperation with The Milli Gazette, is now distributing weekly packets of rice to 113 persons in five villages (Biswaspara 4, Paraspur 40, Taltoli 28, Dayarampur 38 and Farzipara 3 persons). It has also provided medical assistance of urgent nature to 12 persons in 8 villages, cash financial assistance for various reasons to 5 persons. 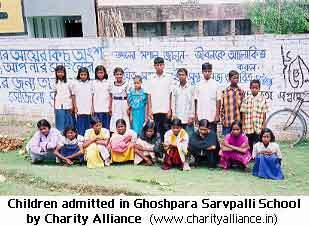 Charity Alliance has also paid admission and tuition fees for 66 destitute students of five schools in and around Jalangi. The number of such students is expected to cross 100 soon. Charity Alliance now has two full-time relief workers in Jalangi area (Golam Kibriya and Saiful Islam, both are graduates). 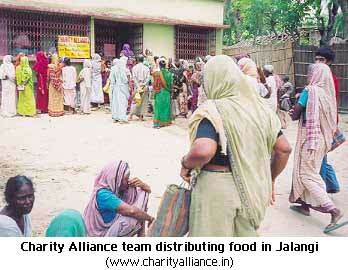 Full details of this assistance with names of beneficiaries will soon be posted on Charity Alliance website. Nadim Ahmad has gone back to Jalangi to review the relief operations and needs. The above is his first report after his return to Jalangi on 17 May.